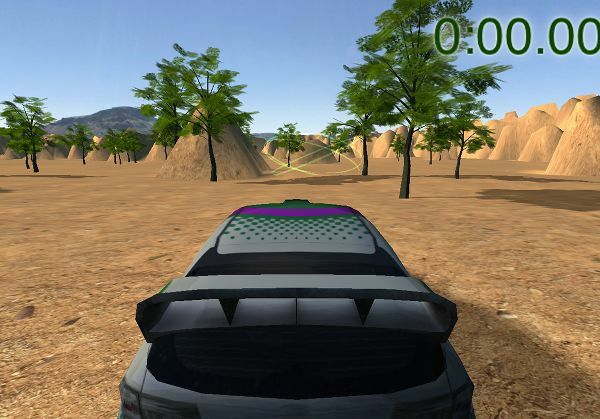 Trigger Rally Online Edition race start on a sand track with green trees and an animated checkpoint ahead. Trigger Rally Online Edition [github] is a WebGL racing game based on the concept of Trigger Rally. It has a more detailed car model than the classical game, however I am not sure about the game data license. It features replays too! The project was created by the lead coder of the original/classical Trigger Rally version. By the way: if you are interested in helping me to sort out missing license-clear graphics and sounds for the classical Trigger Rally, I created a thread on OpenGameArt for that purpose.